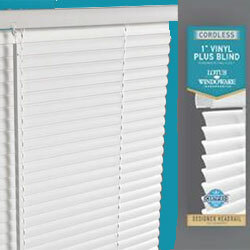 Shop Cordless 1" Vinyl Plus Mini Blinds featuring a reinforced steel head and bottomrail, along with premium Room Darkening warp and crack resistant pvc – plastic slats. Designed for durability, the Cordless 1" Vinyl Plus Mini Blind withstands heavy-duty abuse without compromising design in these cheaply priced blinds that are great for home, office and apartments. These blinds offer great prices individually along with additional case quantity discounts making these Cordless 1" vinyl blinds the perfect choice for the budget minded decorator. Use the easy price chart to access online ordering and fast shipping information on these in stock vinyl blinds. For questions or help with any of our window treatments, email us or call our knowledgeable and friendly customer service team. Don't see your size Cordless 1" Vinyl Mini Blind? Custom Cutting available for $10 per blind.